Discover the big advantages of the surprisingly small Sharp ER-A450T. With counter space at a premium, the ER-A450T's compact design with high capacity drawer is the perfect fit for your business. And with its bright LED displays, both operator and customer can read transactions with ease. 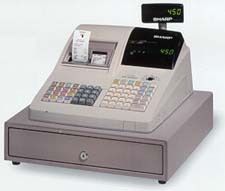 The ER-A450T offers a range of advantages few other electronic cash registers can equal. Full Hourly/Hourly by Range - Provides the store owner with the number of transactions and sales total by 1 hour or 30 min. increments for a 24 hour period. This becomes a useful tool in determining which times of the day your business is most successful. The hourly report can also be useful to determine when extra employees are necessary.